2016 Community Chess Club of Rochester Champion! After a great game, Webster Kehoe congratulates Lev Paciorkowski on Lev's win. Nov. 3, 2016. The 20th Annual CCCR Championship: Lev is our new club champion! The 5th and final round of the 20th Annual Community Chess Club of Rochester (CCCR) championship took place Wednesday night at the Rochester Chess Center on November 2nd, 2016. 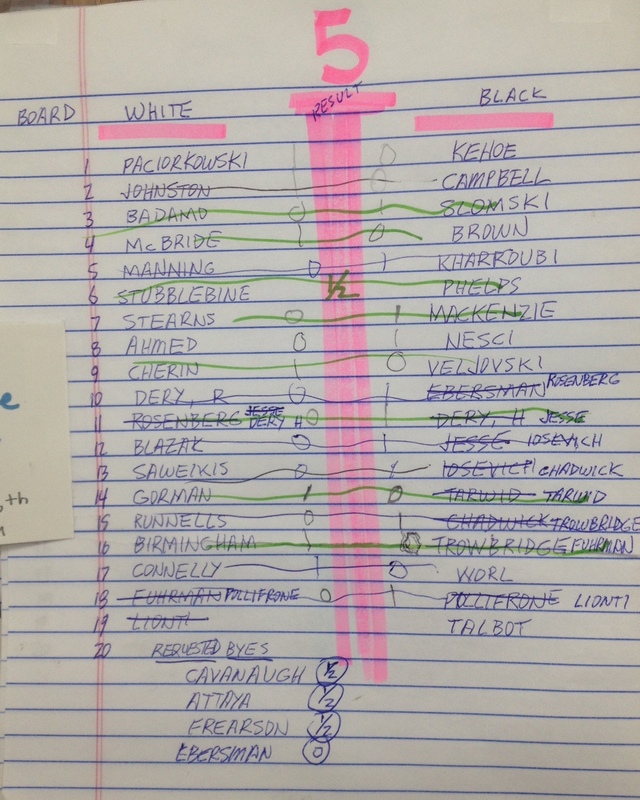 On the top board, Lev Paciorkowski (USCF rating 2310) won his game against 2014 CCCR club champion Webster Kehoe (USCF rating 2046) in a close game. 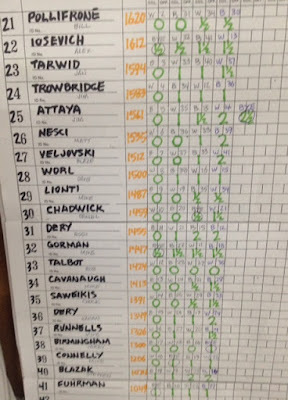 Lev finished with a perfect 5.0 score in five rounds. With that win, Lev became the 2016 club champion, succeeding Clif Kharroubi, the 2015 club champion, who finished with 3.5 points. Both Lev and Webster have considerable experience playing big games as both play in many tournaments and have had many successes. 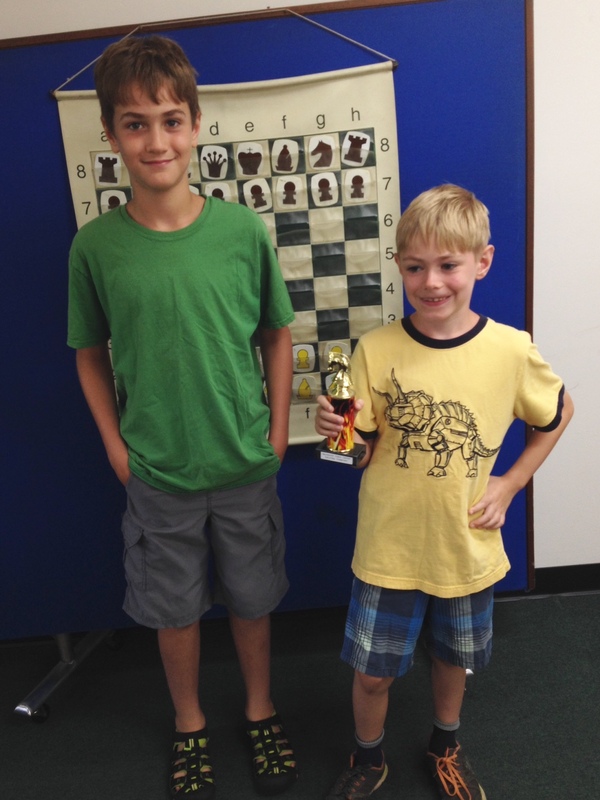 Lev and Webster are well on their way to higher chess ratings and more successes in chess tournaments. Both Lev and Webster play on high school chess teams and are very active chess players, particularly in local tournaments. Daniel Johnston (USCF rating 2114) won his game against David Campbell (USCF rating 1945) to finish with 4.5 points and achieve second place. Webster finished with a 4.0 score and a second place finish by tie-breaks. Rounding out the top 5, Matt Slomski took 4th place with 4 points by tie-breaks, and Ken McBride took 5th place with 4 points by tie-breaks. 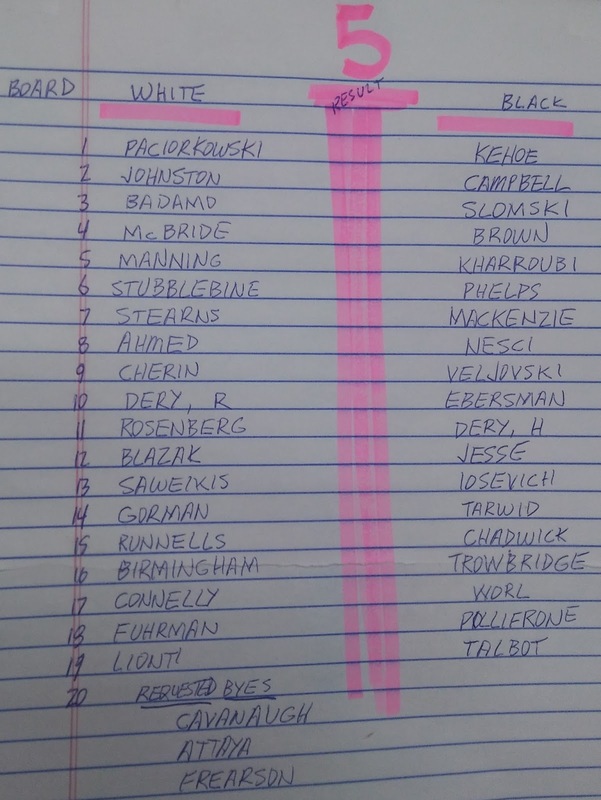 Other prizes earned were as follows: U2000: David Campbell with 3.5 points, U1800: John Frearson with 3.5 points, U1600: Matt Nesci with 3 points, U1400: Hanan Dery with 2 points, and U1200: Steve Blazak with 2 points. 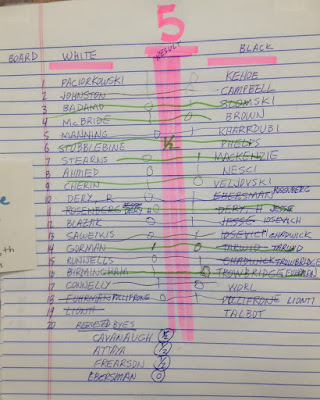 Upsets in the 5th round included Matt Nesci's win over Jamshed Ahmed in a very interesting end game, Mike Connelly's win over David Worl, and Mike Lionti's win over Bill Pollifrone. The gallery has been updated with 5th round photos. Please also visit and bookmark Jim Trowbridge's chess blog which has more coverage and chess games from this event. The awards ceremony will be held at the Rochester Chess Center at 7:30pm on Nov. 16th and cake and coffee will be served. Regular G/80d5 games will follow the awards ceremony. The chief TD was Ron Lohrman, with assistant TDs Mike Runnells, Ken McBride and Mike Lionti. We look forward to next year's annual CCCR chess simultaneous when Lev Paciorkowski will lead the Simul event. 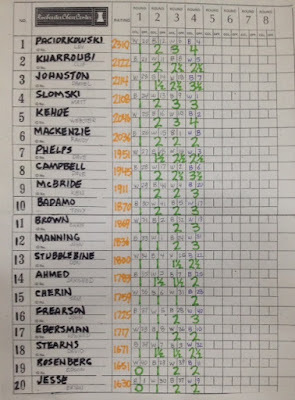 Congratulations to Lev Paciorkowski on becoming the new club champion. Also, congratulations to all our other prize winners. Click here for the USCF rating report for the CCCR Championship. 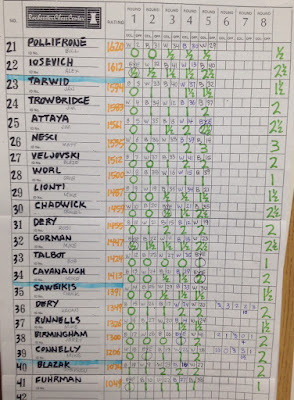 Here a complete summary of the tournament, prepared by Mike Runnells. 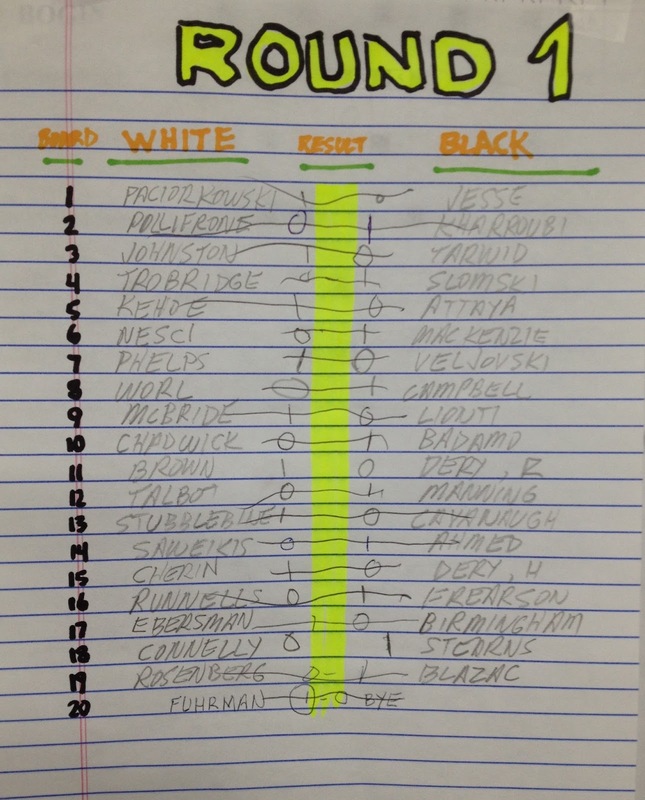 This document has links to plycount.com and you can see anyone's graph and history, even people you played years ago, and there is a USCF link for each player. You can make it full screen by clicking on the symbol in the lower right hand corner. 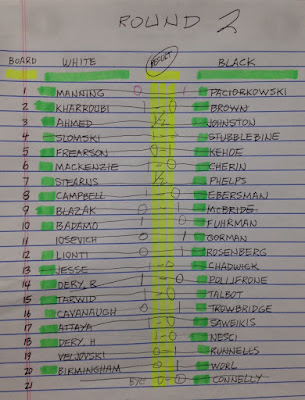 In the 4th round, Lev Paciorkowski won his game against Matt Slomski. 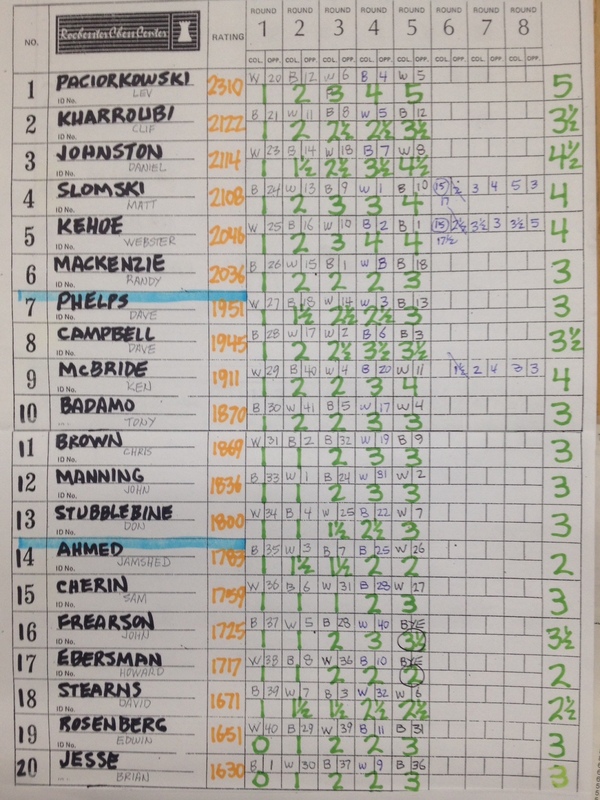 Webster Kehoe won his game against defending club champion Clif Kharroubi. 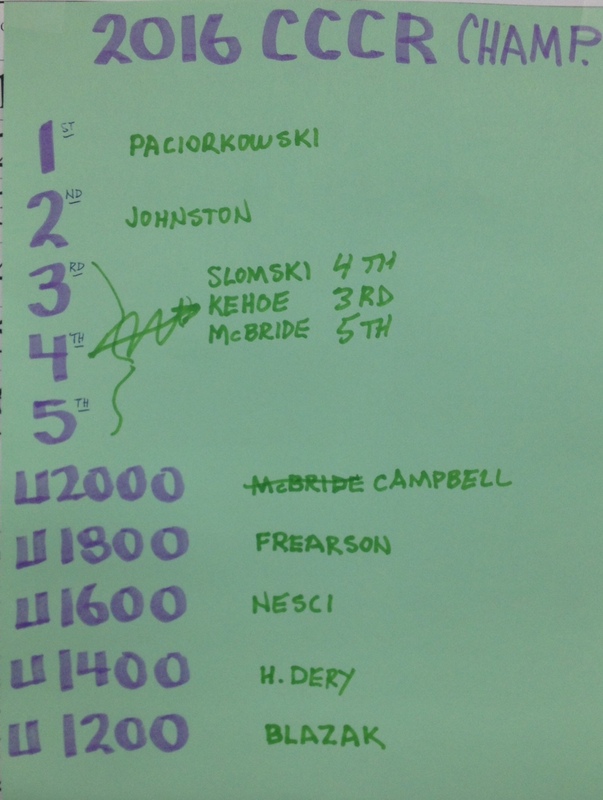 Preliminary pairings for the final round. 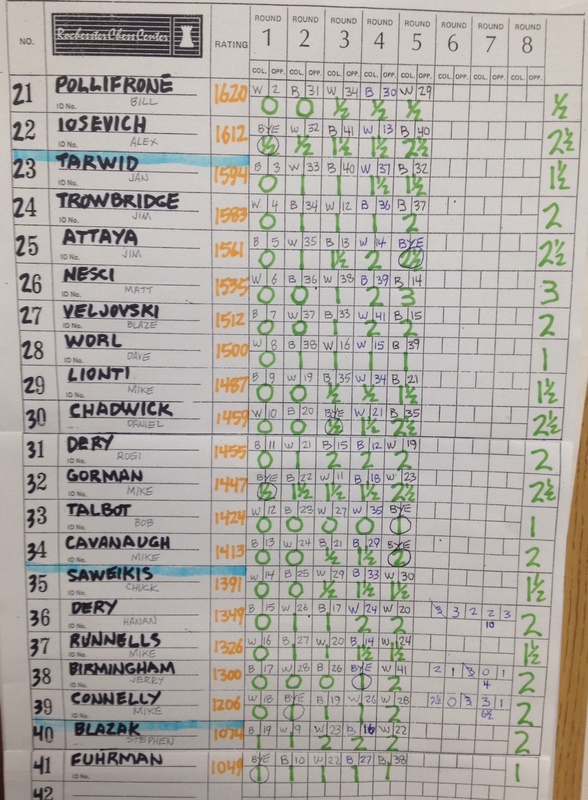 CCCR Championship Results for Round 4. Round 3 of the CCCR championship. Oct. 19, 2016. Scroll to the photo gallery link below to see the Cross Table. 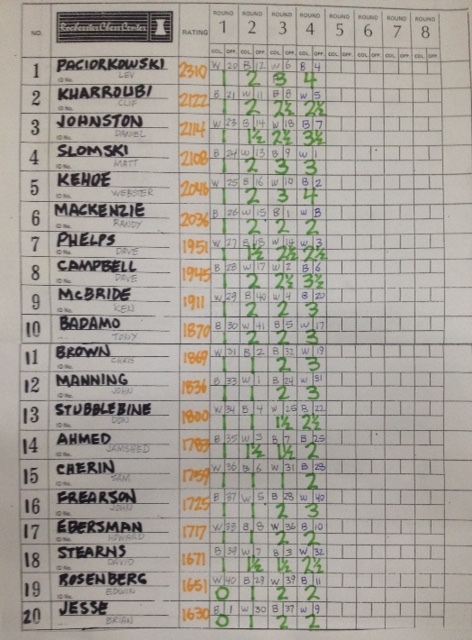 CCCR Championship Results for Round 3. 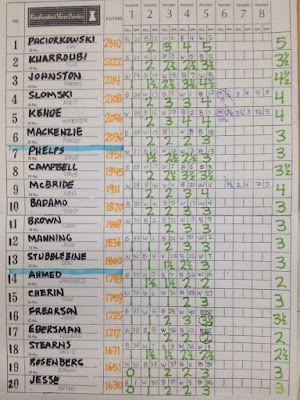 Defending club champion Clif Kharroubi won his game against Chris Brown. Oct. 12, 2016. 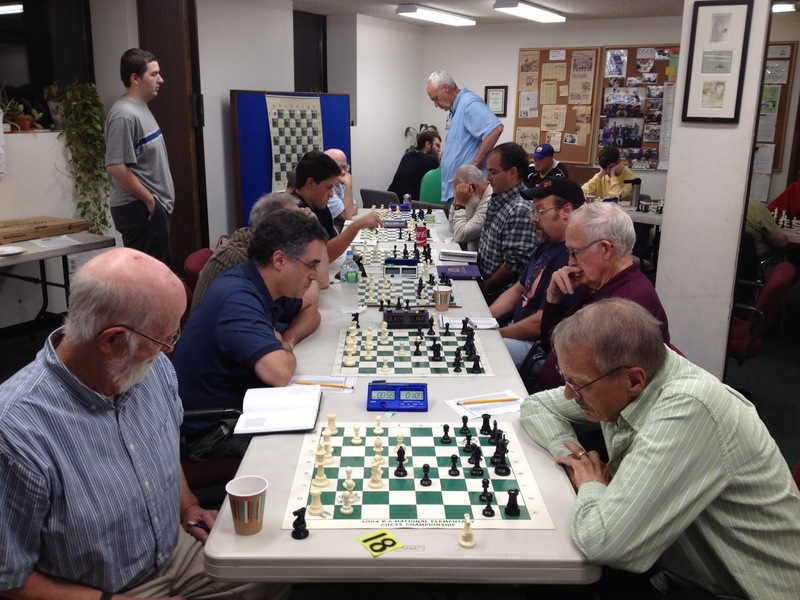 The second round of the 20th Annual Community Chess Club of Rochester (CCCR) championship was held, Wed. Oct. 12, 2016 at the Rochester Chess Center. Round #2 photos have been added to the gallery link below. 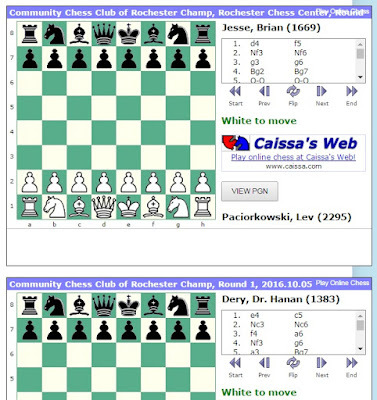 Round #3 will be held at the Rochester Chess Center, 221 Norris Drive, Rochester, NY 14610 on Wed. Oct. 19th, 2016. Visitors and spectators are welcome. Rated games can also be played which are not part of the club championship tournament. Sample of what you can find on Jim's Smoke The Pawn blog. 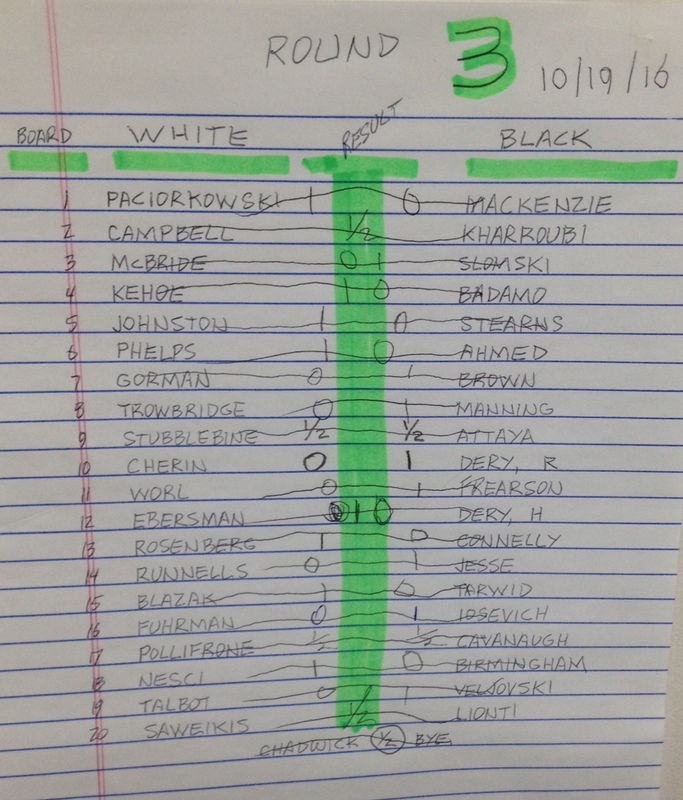 The first round of the 20th Annual Community Chess Club of Rochester (CCCR) championship was held last night, Wed. Oct. 5, 2016 at the Rochester Chess Center. Thirty nine players participated in the first round. 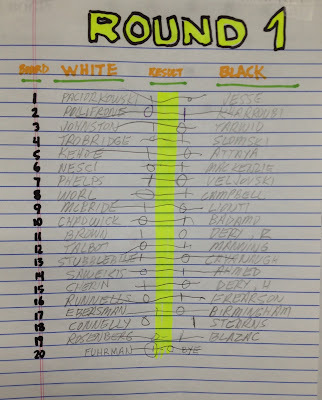 Last year's champion, Clif Kharroubi won his first game against Bill Pollifrone. 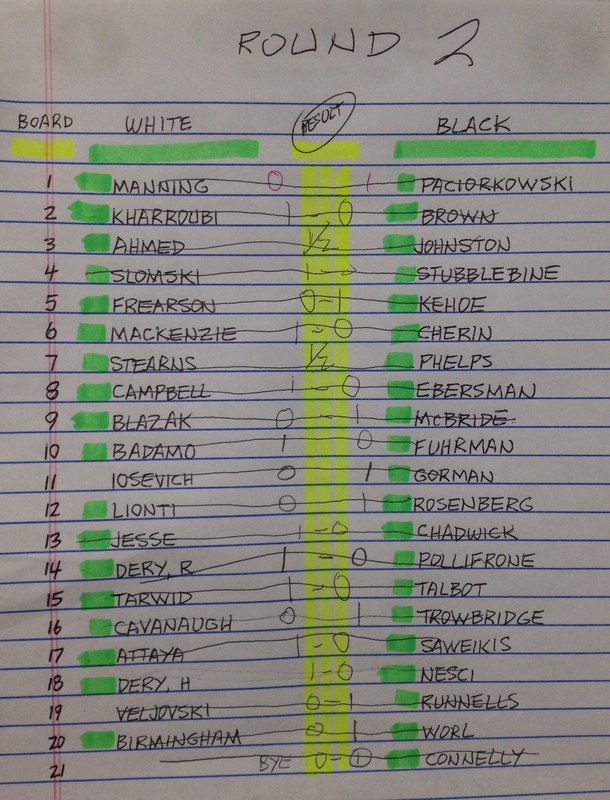 There was only one upset with Steve Blazak winning his game against Edwin Rosenberg. 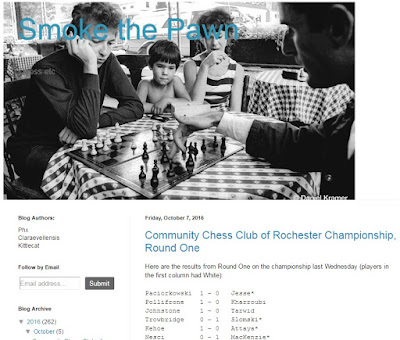 Jim Trowbride is collecting games from the tournament and several will be posted online on his blog - Smoke The Pawn - and in the quarterly journal Empire Chess published by the NYS Continental Chess Association. Some games will also appear here in this blog. 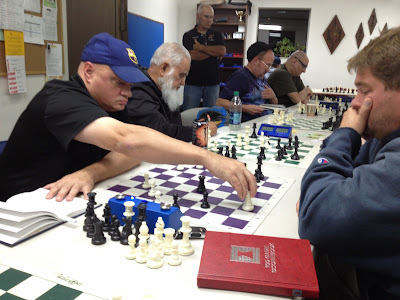 It was a full house at the chess center with another 6 players also in attendance playing rated games that were not part of the championship tournament. The games are G/80d5 USCF-rated and are in the Swiss format. Ron Lohrman is the tournament director. Other TDs are Ken McBride, Mike Runnells and Mike Lionti. The second round of the championship will take place on Wed. Oct. 12, 2016 at 7:30pm. 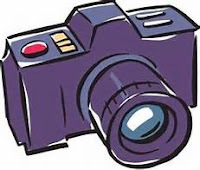 Some photos are available for viewing by clicking on the camera link below. Spectators and visitors are welcome, and several were present for the first round. Snacks and beverages are complimentary and included pizza during the first round. This is a five round tournament, which concludes on Wed. Nov. 2, 2016. Round #1 of the Community Chess Club of Rochester Championship. Oct. 5, 2016. Thanks to Howard Decker for contributing several photos. at the Rochester Chess Center. Registration ends at 7:15 pm. Visitors and Spectators are welcome. Pizza and snacks will be served. 138th New York State Championship! Once again, this year's championship was held at the Marriot in Albany, NY. There were 38 players in the Open Section and 208 players overall. One of our own Rochester players, Lev Paciorkowski, had a brilliant tournament. 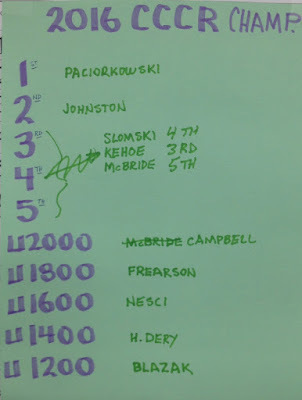 Lev was on board #1 for the final round, tied for first place. Lev (2294) did not win the final game against Aleksandr Ostrovskiy (2490), but nonetheless finished with an excellent 4-point score in the Open Section. Lev's USCF rating also jumped from 2294 to 2303 which is another fine achievement. The chess club would like to extend congratulations to Lev Paciorkowski for an excellent performance at the NYS Championship. One of his games from the 2016 NYS Championship is posted below. Click HERE for the USCF link to the 2016 NYS Championship tournament results. The annual Community Chess Club Championship is coming up in October. 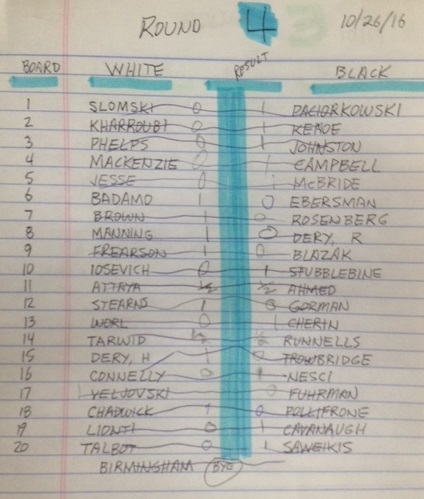 Clif Kharroubi is the defending chess club champion. Scroll down in the blogs space for details given on tournament flyer. Sign up at the Chess Center. Entry fee: only $5, and bring snack to share for one round (or $5 toward snack). Over $1000 in guaranteed prizes! 6 Game pre-requisite. Details at Chess Center. This is the second biggest annual local tournament! If you are not a club member, visit out club and and play some chess with us. We play Wednesday at 7:30pm (G/80 d5) and registration is between 6:30pm and 7:20pm. We would be happy to have you come play some chess with us! Non-tourament games can also be played while the championship is in-progress. at Arkport Village Hall, 6 Park Ave., Arkport, NY 14807. BRING SET, BOARD, AND CLOCK, NONE PROVIDED. 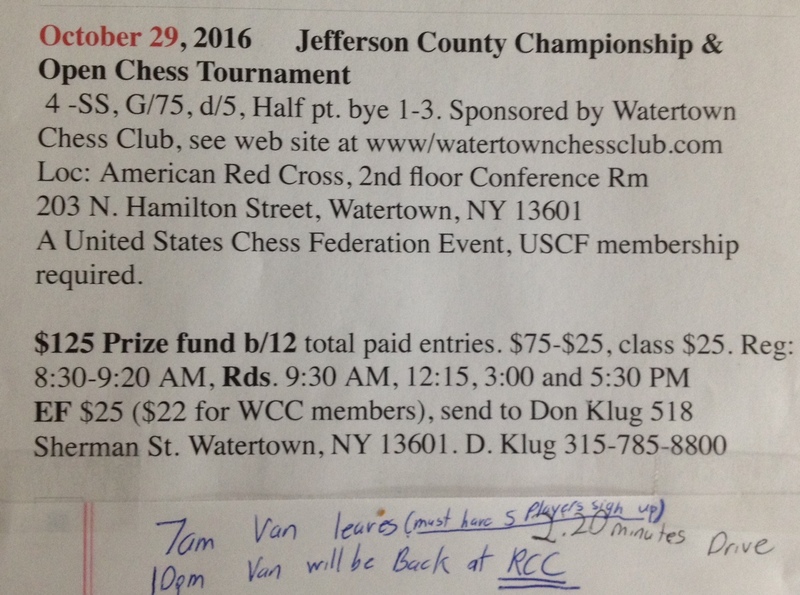 TRANSPORTATION: Add your name to list at Chess Center to ride in the Chess Center's van. 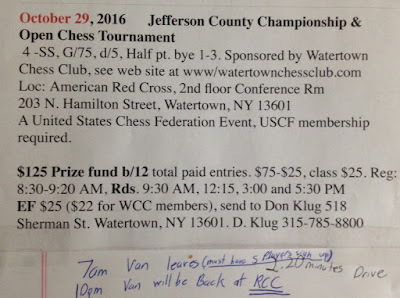 Van leaves chess center at 8:30am. Small fee for transportation. ** Don't forget to bring set, board, clock, etc.. Good places to eat nearby. This is an excellent tournament! Here are some recent photos from the Chess Center. Joe Sarratori analyzing the chessboard. Saturday Youth tournament: Every Saturday from 10am to 1pm. Trophy & Prizes awarded. $5 entry fee. (Saturday - Monday) and will reopen on Tuesday Sept. 6th. The Monday Night summer chess league make-up night is Sept. 12th. The Monday Night fall league begins on Sept. 19th (G/90d5). Please register on-site by 6:45pm, or call if you expect to arrive late. Laszlo Tapaszto won his game with Sterling Carroll this past Wednesday night, Sept. 1, 2016. Laszlo is visiting from Caracas Venezuela. From left to right: Adam DeSantis, Jim Trowbridge, Caleb Carroll, Jim Attaya, Laszlo Tapaszto, Mike Lionti, Joe Sarratori. Coming this Labor Day weekend is the NYS Championship in Albany. For more information about this tournament, scroll down for the TLA or click here. 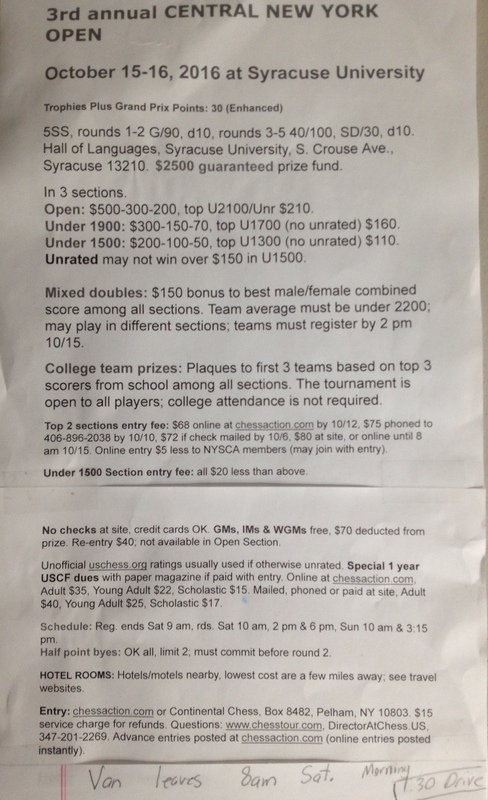 Another tournament coming soon is the 3rd Annual Central NY Open to be held at Syracuse University, Oct. 15-16, 2016. Click here to visit chesstour.com to get more information. Scroll down to previous post for more information, or call 585-442-2430. The Chili Chess Club will award the Club Champion Medal and start a new ladder. There will be a special, one time only, second place prize too. On the new ladder everyone starts with a rating of 800. See Adam or Fred at the Chili Library for more information. can be played for individuals not participating in the championship. 138th annual NY State Championship. Out of state welcome. 6SS, 40/100, SD/30, d10 (2-day option in U2100 & below, rds 1-3 G/40, d10). No 2-day Open Section. Albany Marriott, 189 Wolf Road, Albany 12205 (Thruway Exit 24, I-87 north to Wolf Rd, Exit 4). Luxurious hotel with indoor/outdoor pool, fitness center, free parking, free airport shuttle, many restaurants in area. $13,000 prize fund unconditionally guaranteed. In 5 sections. Open Section: $1500-700-500-300, top Under 2300/Unr $800-400. 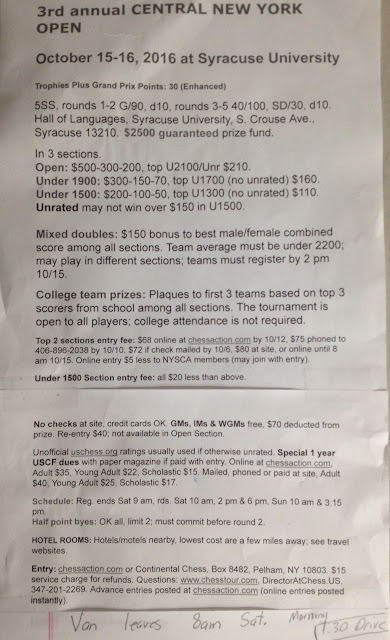 State title and $100 bonus to top scoring NY State resident (both decided on tiebreak if tied). Under 2100 Section: $1000-500-300-200, top Under 1900 $400-200. Under 1800 Section: $1000-500-300-200, top Under 1600 $400-200. Under 1500 Section: $700-400-200-100, top Under 1300 $300-150. Under 1200 Section: $400-200-100-50, trophy to first 3, top Under 1000, Under 800, Under 600, Unrated. Unrated may not win over $150 in U1200, $300 U1500, or $500 U1800. Mixed doubles bonus prizes: best male/female 2-player "team" among all sections: $600-300. Team average must be under 2200; teammates may play in different sections; teams must register before both players begin round 2; teams including an unrated cannot win over $300. Top 3 sections entry fee: $99 online at chessaction.com by 8/31, $110 phoned to 406-896-2038 by 8/29 (entry only, no questions), 4-day $109, 3-day $108, 2-day $107 if check mailed by 8/24, all $120 at site, or online until 2 hours before round 1. No 2-day Open Section. No mailed credit card entries. Under 1500 Section entry fee: All $20 less than top 3 sections entry fee. Under 1200 Section entry fee: All $40 less than top 3 sections entry fee. All: Online entries $7 less to NYSCA members. NYSCA dues $12/yr with 2 issues of Empire Chess or $20/yr with 4 issues; join or renew together with entry. 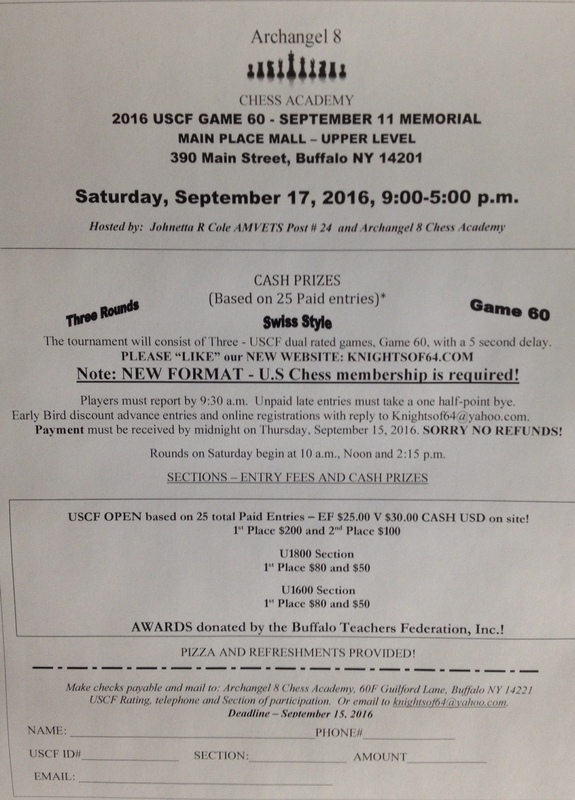 USCF MEMBERSHIP REQUIRED. Special 1 year USCF dues with paper magazine if paid with entry. Online at chessaction.com, Adult $35, Young Adult $22, Scholastic $15. Mailed, phoned or paid at site, Adult $40, Young Adult $25, Scholastic $17. Re-entry $60, all sections but Open. 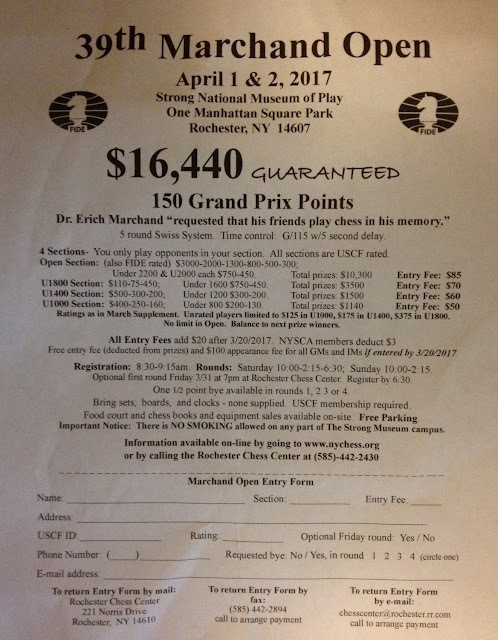 GMs free, $90 deducted from prize. No checks at site, credit cards OK.
3-day schedule: Reg. ends Sat 11 am, rds. Sat 12 & 6, Sun 12 & 6, Mon 10 & 3:15. 4-day schedule: Reg. ends Fri 6 pm, rds. Fri 7 pm, Sat 6 pm, Sun 12 & 6, Mon 10 & 3:15. 2-day schedule: Reg. ends Sun. 10 am, rds Sun 11, 1:30, 3:30 & 6, Mon 10 & 3:15, no 2-day schedule in Open. CCA electronic devices policies will be used. Ratings: September official USCF rating list used. 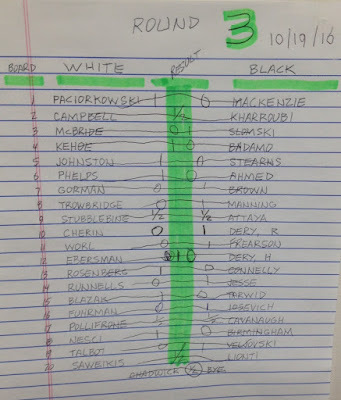 Unofficial uschess.org ratings usually used if otherwise unrated. NYSCA annual meeting, Sunday 9 am. Out of state welcome; NYS blitz title to top NYS resident, on tiebreak if necessary. 5SS, G/5, d0, double round, 10 games, Albany Marriott (see NY State Championship). $$ 1000 guaranteed: $300-150-100, Under 2000/Unr $160-80, U1700/Unr $140-70. EF: $40, NYSCA members $35, at site only, no checks. Reg. ends 9:45 pm, rds. 10, 10:30, 11, 11:30. 12. One half point bye allowed, must commit before rd 2. Blitz rated, but higher of regular or blitz used for pairings & prizes. More tournaments & Activities will be listed soon.